You're not going to want to sit at your dorm desk every time you need to study or work on homework. You're going to want to sit back and relax in comfort sometimes, and that means your dorm bed or even the dorm common room. While these are comfortable places to sit back and relax, you won't really have a work surface which is a problem. Give yourself that work surface so you can study in comfort with cheap dorm supplies like our Pink Parade Lapdesk. 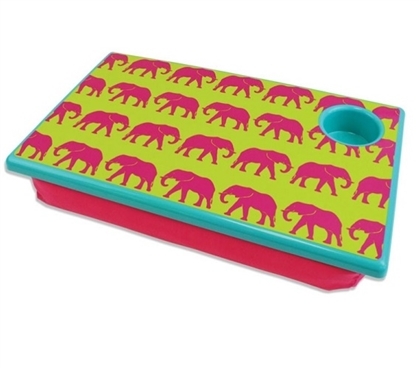 Our Pink Parade Lapdesk has a cute design that will add some fun to your dorm essentials with pink elephants on a yellow backdrop. This dorm necessities item has a cushion on the bottom and a hard surface so you can put your laptop or tablet on your lap without the discomfort or warm skin from the heat of the electronic item. Indented into the surface of this dorm item is a cup holder so you can keep your bottle of water, writing utensils, or phone at your fingertips. Plus, this college supplies item is super light and portable so you can take it to the library, common room, park - wherever you feel inspired to study without being limited by a table surface.